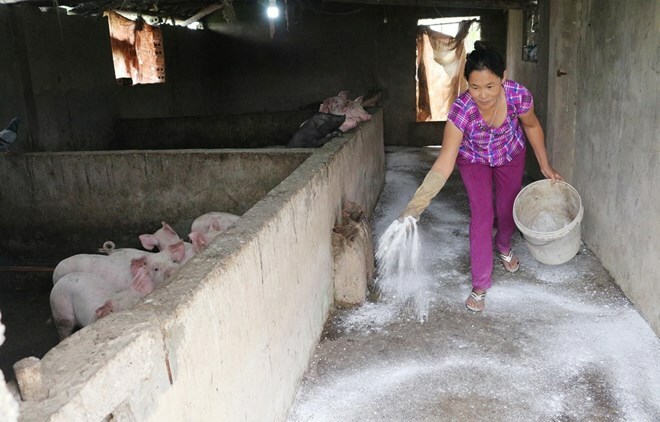 Ha Nam (VNA) – Two hotbeds of African swine fever virus were discovered in Chau Giang commune, Duy Tien district and Tan Son commune, Kim Bang district in the northern province of Ha Nam on April 3, reported the provincial Animal Husbandry and Veterinary Sub-Department. Pigs were also reported dead in Bach Thuong and Chuyen Ngoai communes, Duy Tien district with the virus suspected as the cause. The total number of pigs being slaughtered amounted to 142 the same day. Outbreaks have so far reported from 10 communes of four districts in the locality with nearly 1,100 pigs being slaughtered. Localities in affected areas used more than 2,600 litres of chemicals and 42,500kg of powdered lime to disinfect farms and the surrounding environment. On April 2 in the northern city of Hai Phong, outbreaks erupted in the districts of Duong Kinh, Hai An, Kien An and the communes of Thuy Nguyen, Tien Lang, An Duong, Vinh Bao, Kien Thuy and An Lao. Nearly 18,900 pigs were culled. The municipal Animal Husbandry and Veterinary Sub-Department supplied 71,000 litres of chemicals to localities to combat the epidemics. More than 310,000kg of powdered lime was used for disinfection.